Woohoo!! Anything Goes! 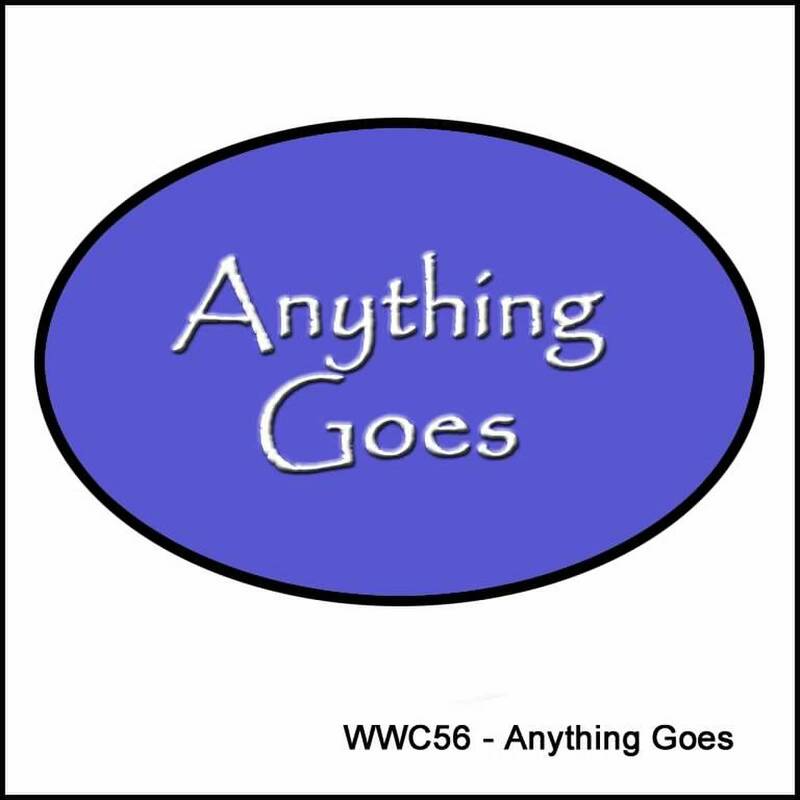 This week’s challenge with the Watercooler Wednesday is ‘Anything Goes’ – that means you’re free to create what you want! What’s your favourite kind of challenge? Do you prefer working from a sketch, a technique or a colour group? Or do you like these ‘free-for-all, do what you want’ challenges? Sympathy cards can be difficult to make at the time you need them; I find that my feelings can get in the way of the creative process. So, it’s always good to make a few when you don’t need them; then you’re ready to give a card right away. Of course, if I want to make a card that reflects the personality of the person who has passed, I will make that too, and give it a bit later. I really love using the Thoughts & Prayers set; the images in this set of the tree – seen above – and the arching branch with small blossoms are just soothing in some way. I won’t get into my whole existential musings – enough to say that I do like this set! On this card, I started with a panel of Whisper White cardstock, and stamped the sentiment in Mossy Meadow in the bottom right hand corner. I then stamped the tree in Soft Suede ink, then used the Curvy Corner Trio Punch for the lovely scalloped look on opposite corners. The edges were lightly sponged using a Dauber and Mossy Meadow ink. The stamped panel was layered onto a panel of Mossy Meadow cardstock, which in turn was attached to a panel of gorgeous English Garden Designer Series Paper. I wrapped the Gold Cording Trim around the left side twice, then tied off with a small bow. 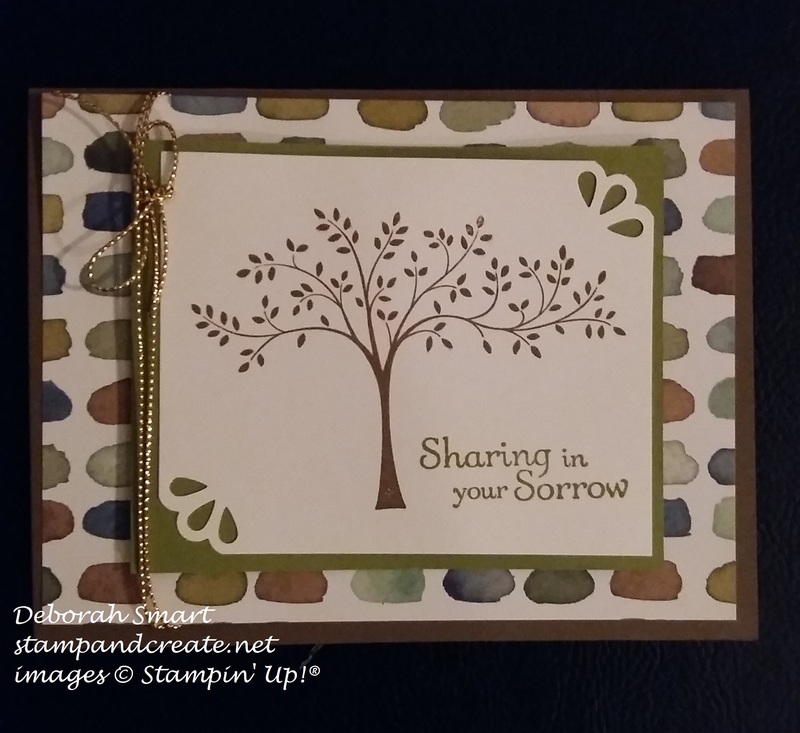 The card front was then popped onto a card base of Soft Suede cardstock, using Stampin’ Dimensionals. I didn’t take a picture of the inside, but the inside Whisper White panel opposite corners are also punched with the same scallop, and the sentiment “Praying for friends to comfort you, faith to uphold you, and loving memories to heal your heart” is stamped in Mossy Meadow ink. If you haven’t seen this set – it’s been around at least 2-3 years – check it out in the Annual catalogue, on page 26. I’d love to read any comments you have – let me know if you like my card, and how you’re enjoying the challenges! I do hope you’ll head over to the Watercooler Challenges blog page, and see the other amazing cards that the rest of the Watercooler Artists have designed. I’ve seen them – you’ll want to see them, too! Then, put together your card (or maybe it’s already made! just make sure you haven’t already shared it) and play along with the challenge. I can’t wait to see what you’ll make!